This band was originally formed by ex-Yardbirds' singer/harp player Keith Relf and drummer Jim McCarty in Surrey, England, in 1969. Their debut album was an experimental effort which sought to fuse classical, folk, jazz, blues and rock. It was full of melodramatic piano playing but the stand-out track was Island, which featured some gorgeous vocals by Jane Relf. Certainly an interesting album, it only achieved moderate success and Relf and McCarty left not long after. A second album, Illusion, was recorded for Island but it never got beyond the test pressing stage. It was only released in Germany prior to its reissue in the nineties. Indeed, by the time they signed to Sovereign for the Prologue album none of the original line-up remained. Prologue attracted far more attention in the US than in the UK and for the next couple of years the new line-up made the US their base. Their aim remained the same - the fusion of classical music and rock - and they acquired two new assets, Annie Haslam's crystal clear vocals and the lyrics of poetess Betty Thatcher. They developed a cult following in the US. Their finest moments were Turn Of The Cards and Scheherazade And Other Stories, which merged beautiful piano work and Annie Haslam's exquisite vocals. The stand out track on Turn Of The Cards is Mother Russia with its melodramatic piano introduction, Annie Haslam's exquisite vocals and appealing orchestrated passages. Running Hard is similar with a nice piano intro. and heavy orchestration. Things I Don't Understand had more good piano work, several tempo changes and some lovely vocal passages, whilst Cold Is Being is sadder and more centred around Haslam's vocals. Scheherazade.... is similar in style but better all round. The opener A Trip To The Fair had all the ingredients of Mother Russia but the end result is more polished, whilst The Vultures Fly High and Ocean Gypsy showcased Haslam's vocal abilities and Tout's keyboard dexterity. The whole of side two contained their interpretation of Rimsky-Korsakov's Scheherazade, which featured a stunning performance from Haslam augmented by an orchestra. As 1976 eclipsed their best success was still to come (in 1978) with A Song For All Seasons, which featured more superb vocal harmonies and became their best selling UK album, peaking at No 35. It also spawned the hit single, Northern Lights, which got to No 10 here. They continued to record well into the eighties and Haslam also recorded a solo album, Annie In Wonderland. 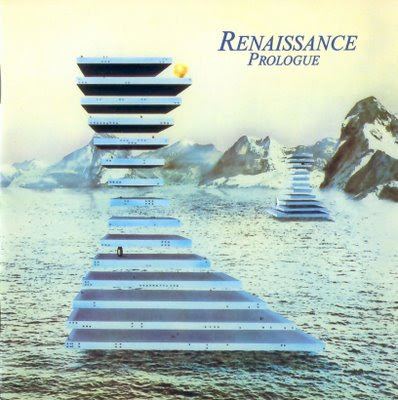 From ProgressiveRock : Renaissance first appeared in the timeline back in the late sixties, as a group formed by ex-Yardbird members Keith Relf and Jim McCarty. Somehow - and quite incredibly - the same band reappeared years later with no original members! The "new" Renaissance released two albums for Capitol, Prologue in 1972 and the more notable Ashes Are Burning the following year. Their auspicious "re-debut" built upon the formula of their predecessors, but not without changes. Tout’s grand piano bangs open "Prologue" with a quote straight out of the Russian school of Prokofiev and the like. But Annie Haslam’s voice, soaring along with the melody, was the big news. Far more West End than Carnaby Street, she would come to define Renaissance. "Kiev" offers more of the same (those Russians again), propelled by the brisk rhythm of drummer Terry Sullivan and bassist John Camp. Haslam though breaks out for her first lead vocal on "Songs Of The Sea". She had a huge voice and one that would be further exploited as the band went on. The second side opened with the anachronistic "Spare Some Love", but it did feature some electric guitar, something Renaissance music would rarely feature. "Rajah Khan" was the album’s highlight, a raga flavored instrumental that featured some cool VCS3 from Curved Air’s Francis Monkman. Fairly psychedelic, it crossed over into some interesting Progressive territory. Their next album, 1973’s Ashes Are Burning, saw songwriter Michael Dunford replace Rob Hendry on guitar. The songwriting would undergo further refinement towards what would become the Renaissance sound, particularly on "Can You Understand" and the excellent title track. The winsome "Carpet Of The Sun" was the first to present string arrangements.